The SunTrust Travel Rewards Credit Card currently has an Informr score of 7.5 out of 10. This score is based on our evaluation of 3 sources including reviews from users and the web's most trusted critics. 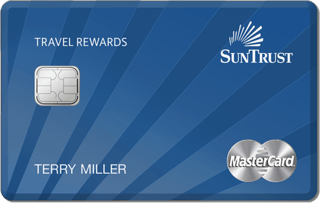 SunTrust Travel Rewards Credit Card is typically available to those with good credit scores (650 or greater). With a 15-month introductory period for balance transfers and a decent rewards rate, the SunTrust Travel Rewards card offers good value as a balance transfer card. Ideal for frequent travelers who spend heavily enough to offset the $89 annual fee. SunTrust deposit accountholders make out especially well on the deal, thanks to potentially generous cash back bonuses and annual fee waivers for high-end accounts. Get a cash back bonus of up to 50% based on your deposit relationship with SunTrust, when you redeem your cash back directly into a SunTrust Checking, Savings or Money Market account. It offers the benefits of 3% cash back on travel purchases, no foreign transaction fees and up to a $100 statement credit every 5 years, as reimbursement for your application fee for Global Entry or TSA Precheck. Don’t forget this is all on top of $250 bonus when you spend $3,000 in purchases within 3 months of account opening.